This is about as good of a backup plan as they could have. Colby will face the winner AKA Mr Till. If Colby was available he wouldn’t be the alternate, he’d be in the title fight. Till is fighting because Colby opted for sinus surgery and was stripped of the interim title. The champ was ready to go in September and the interim champ wasn’t. If Colby is ready to go in October/November, they should book Colby vs Usman for a new title shot eliminator (unless Usman has to step in next month). 8-0 in the UFC is pretty special, and against some decent opposition (Maia, Edwards). Now he just has to beat a Colby/Wonderboy/Till/Woodley to cement it, and he might get his chance in September if Till misses weight or Woodley gets injured. Kamaru has the Tom Brady chip on his shoulder. Overlooked. Nice. They should do this for every main event. 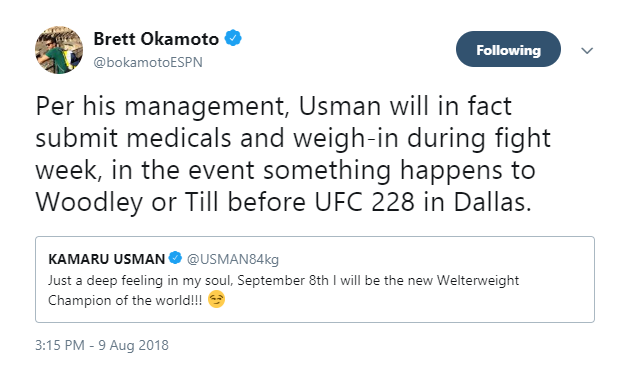 Usman isn’t besting Till, Woodley, or Covington. Don’t think he can beat Lawler either. hasnt had to fight much of anyone on his rise up and hasn’t been impressive. His last knockout was nice but technically lacking. Have a 3rd figher on standby. They could pay him a weekly fee to train and be ready. Something along the lines of what a sparring or training partner would get. If one of the fighters bows out then he can step in and take the show purse and if he wins, the win purse. Now that's a fancy shirt fit for a Nigerian prince. Must have finally managed to transfer the family fortune out of Africa so he could go fancy shirt shopping. Some lucky schmuck on Craigslist must have made a pretty penny finally answering the right ad. Its nice the UFC is now doing something about the high main/co main pull out problem. Have the next contender on back up just in case. I know they had Volkov on back up and weighed in for the DC/Stipe fight. Even his highlights are unimpressive. Dude has the striking technique of a pile of dogshit. Whether or no the's the guy who can win the fight, it's nice to see the UFC has started to take steps to ensure fights happen. They could do this by having more fights on a card or have these back up guys prepped and ready. I just hope that if they are having back up guys they are taking care of them while they do it. The thing is would Woodley agree to fight a replacement if Till is injured? Many champs in the pasr have refused, Jon Jones comes to mind.